On Boxing Day 2004, we witnessed one of the most catastrophic natural disasters in living memory. A massive earthquake triggered a series of devastating tsunamis that crashed onto the shorelines of 14 countries across the Indian Ocean. More than 228,000 people were killed and almost two million were left homeless. The scale of the disaster was something the modern world had never seen before. Thanks to your generous support, CARE was able to reach more than 1.3 million people with life-saving emergency assistance, and the long-term help they needed to rebuild their lives. The response of CARE supporters was incredible. 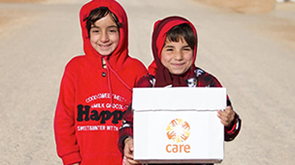 Worldwide CARE raised US$185 million. Nearly all of the money was spent on direct tsunami response within five years of the disaster. Some projects, including programmes to help improve local emergency responses and provide ongoing skills training, continued into 2011. 90% of the funding was spent on programmes and 10% on administration. The tsunami was a turning point for the global aid community. Never before had such a massive, coordinated emergency response and reconstruction programme been launched across so many countries in response to a natural disaster. The world succeeded in helping the affected countries rebuild and recover, and the way we respond to and prepare for crises was altered forever. Mariani Abdullah and her husband, Sulaiman Adam, outside their home in Banda Aceh. They were one of the first families to receive a permanent house from CARE after the tsunami. “The people who survived the tsunami worked against the odds to rebuild their homes and communities,” said Barbara Jackson, CARE International’s Humanitarian Director. The best way to honour them, and the memory of those who died in the disaster, is to continue to work together to find new, innovative solutions to help people affected by crises.